In January 2019, China's manufacturing purchasing managers index (PMI) was increased, Non-manufacturing purchasing managers index kept increased in two months, the increase has expanded, and the non-manufacturing purchasing managers index of service industry increased significantly. 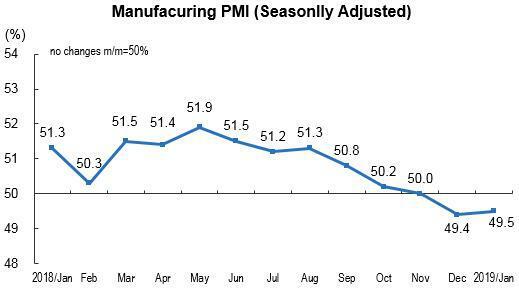 The overall PMI output index rose moderately, more than the high point of the fourth quarter of last year. In January 2019, China's manufacturing purchasing managers index (PMI) was 49.5 percent, an increase of 0.1 percentage point from last month. In view of the sizes of enterprises, the PMI of large-sized enterprises was 51.3 percent, increased 1.2 percentage points from last month, and was still higher than the threshold; that of medium-sized enterprises and small-sized enterprises were 47.2 and 47.3 percent, which decreased 1.2 and 1.3 percent from last month respectively, and were all lower than the threshold. Among the five sub-indices composing PMI, the production index and supplier delivery time index were higher than the threshold. The new orders index and main raw materials inventory index and employed person index were lower than the threshold. Production index was 50.9 percent, increased 0.1 percentage point from last month, and was higher than the threshold, indicating that the Manufacturing production continues to expand, and the pace of manufacturing production accelerated. New orders index was 49.6 percent, a decrease of 0.1 percentage point month-on-month, and was lower than the threshold, showing that the manufacturing market demand was decreased. Main raw materials inventory index was 48.1 percent, increased 1.0 percentage point from last month, and was still lower than the threshold, indicating that the amount of manufacturing industry’s main raw material inventory decreased, while the decline of manufacturing industry’s main raw material inventory has narrowed. Employed person index was 47.8 percent, decreased 0.2 percentage point from last month, lower than the threshold, indicating that the amount of manufacturing enterprises’ labor employment kept decreased. Supplier delivery time index was 50.1 percent, decreased 0.3 percentage point from last month, and was little higher than the threshold, indicating that the delivery time of manufacturing raw material suppliers has accelerated. 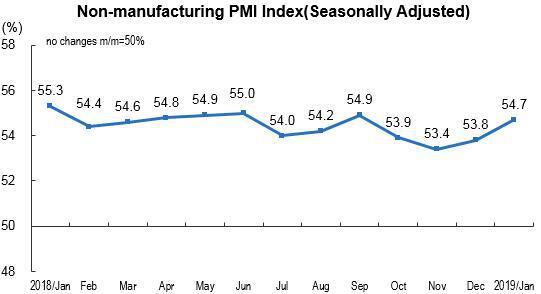 In January 2019, China's non-manufacturing purchasing managers index was 54.7 percent, an increase of 0.9 percentage point from the previous month, indicating that the pace of non-manufacturing growth has accelerated. In view of different industries, non-manufacturing purchasing managers index of service industry was 53.6 percent, an increase of 1.3 percentage points from the previous month, and the pace of service industry increase has accelerated. Of which, the indices of Wholesale, railway transport, Air transport, Post, telecommunications, broadcasting, television and satellite transmission services, Monetary financial services, insurance were positioned in the high level of the range which above 57.0 percent, and the industry performance is more active; The indices of capital market services, real estate were located in the contraction interval, and the total volume of business kept decreased. Non-manufacturing purchasing manager index of construction industry achieved 60.9 percent, a decrease of 1.7 percentage points from the previous month, the pace of growth increase has slowed down. New orders index was 51.0 percent, increased 0.6 percentage point from the previous month, and was higher than the threshold, indicating that the pace of non-manufacturing industry’s market demand has accelerated. In view of different industries, the new orders index of service industry was 50.2 percent, increased 0.9 percentage point from the previous month, and rose above the threshold. The new orders index of construction industry was 55.8 percent, decreased 0.7 percentage point from the previous month, and and still located in the high level expansion interval. Input price index was 52.0 percent, up by 1.9 percentage points from the previous month, and was higher than the threshold, indicating that the increase of input price increase during the process of non-manufacturing enterprises’ operating activities has expanded. In view of different industries, the intermediate input price indices of service industry was 51.8 percent, increased 2.2 percentage points from the previous month. The input price index of construction industry was 53.1 percent, an increase of 0.3 percentage point from the previous month. The sales price index was 48.9 percent, up by 2.2 percentage points from the previous month, and was still lower than the threshold, indicating that the overall level of non-manufacturing sales prices decline has narrowed. In view of different industries, the sales price index of service industry was 49.4 percent, an increase of 2.1 percentage points from the previous month. The sales price index of construction industry was 51.9 percent, an increase of 2.8 percentage points from the previous month. Employment index was 48.6 percent, an increase of 0.1 percentage point from the previous month, and was lower than the threshold, indicating that the amount of non-manufacturing enterprises’ labor employment decreased. In view of different industries, the employment index of service industry was 47.8 percent, an increase of 0.1 percentage point from the previous month. The employment index of construction industry was 53.1 percent, a decrease of 0.4 percentage point from the previous month. Business activities expectation index was 59.6 percent, a decrease of 1.2 percentage points from last month, continually to stay in the high level of the range, indicating that non-manufacturing enterprises companies were optimistic about market development expectations. In view of different industries, the business activities expectation index of service industry was 58.8 percent, a decrease of 1.4 percentage points from the previous month. That of construction industry was 64.5 percent, unchanged from the previous month. 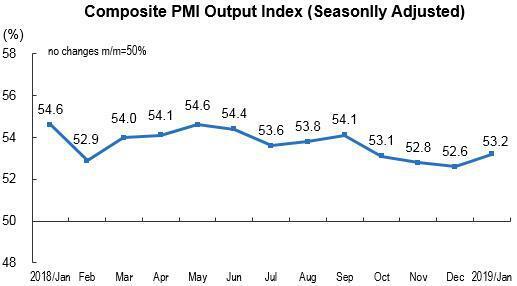 In January 2019, China's Composite PMI Output Index was 53.2 percent, an increase of 0.6 percentage point from last month, indicating that the economy has improved, and the overall production and operation activities of Chinese enterprises continued to expanded, while the index of expansion has accelerated. Composite PMI Output Index was calculated by weighted summation of the manufacturing output index and non-manufacturing business activity index. Their weights are determined by the proportion manufacturing and non-manufacturing industries in GDP. This index will be released since January 2018.